Results: should 38 Degrees respond to the situation in Syria? 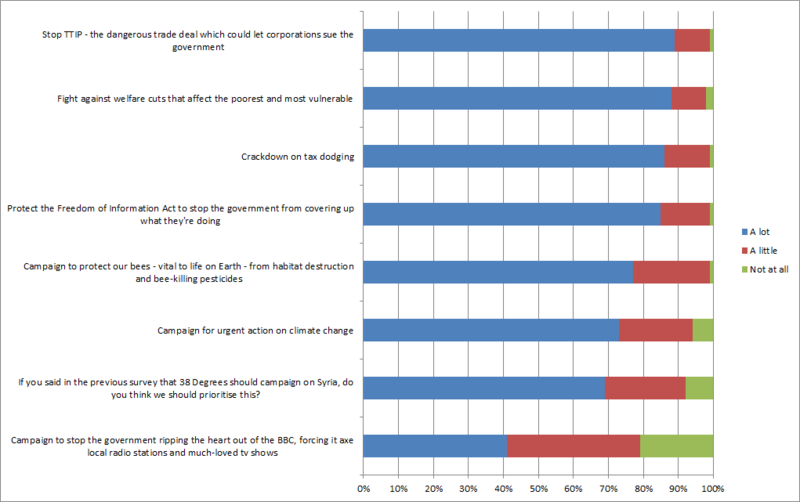 Public opinion is split on whether to bomb Syria. It’s a complicated issue, and every result of a ‘public opinion’ poll says something different. So yesterday, all 38 Degrees members received a survey, asking for opinions on airstrikes in Syria. 135,661 38 Degrees members have taken part so far. Do you think the UK should join airstrikes against ISIS targets in Syria? 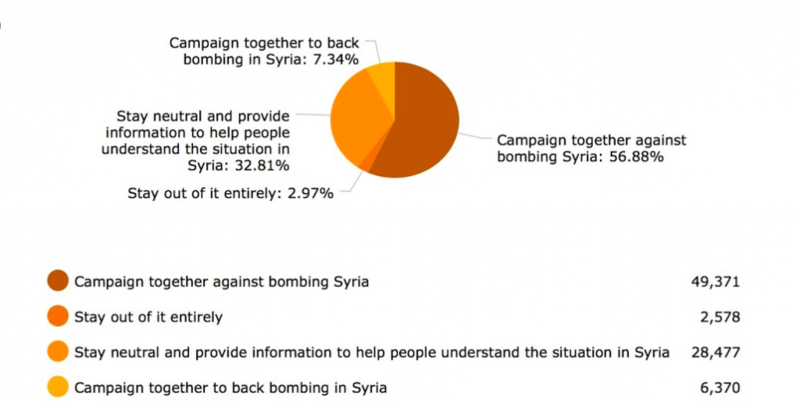 This shows that the majority of 38 Degrees members are opposed to airstrikes in Syria. What do you think 38 Degrees should do? This shows that 57% of 38 Degrees members think 38 Degrees should campaign against airstrikes. However, 44% of 38 Degrees members have a different opinion – from supporting airstrikes, to wanting 38 Degrees to stay neutral, to staying out of the issue entirely. 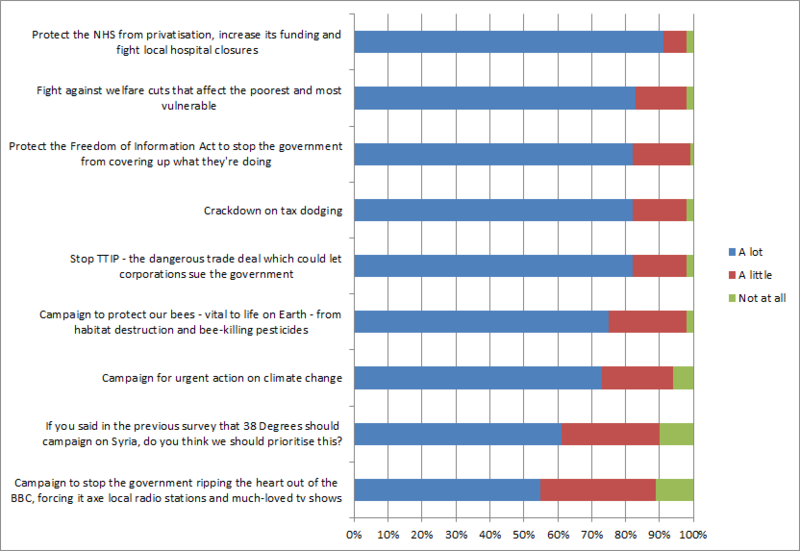 It comes second-bottom of the list of campaign priorities for 38 Degrees members in England, Wales and Northern Ireland and bottom for 38 Degrees members in Scotland. Overall, whilst the majority of 38 Degrees members are opposed to airstrikes, it hasn’t been prioritised as a 38 Degrees campaign by members. This data had fed into the decision for 38 Degrees not to take a stance on airstrikes in Syria at the moment, but to facilitate 38 Degrees members getting in touch with their MPs to share their views. So, before MPs vote at 10pm on Wednesday 2nd December, please email your MP now. All you need to do to email your MP is click here. There’s no suggested text, so everyone can tell their MP what they think.